Posted in: ATP, Cincinnati, Western & Southern Open, WTA. Tagged: 2014, atp, cincinnati, Friday, Interview, masters, novak djokovic, quarterfinals, results, roger federer, Round of 16, Schedule, Stan Wawrinka, tennis, thursday, video, Western & Southern Open, wta. Nearly everyone expected to win did so today, except Novak Djokovic. It didn’t break his heart or at least he didn’t show it. Novak Djokovic will apparently play with two rackets at the US Open in an effort to maintain his world #1 ranking. At least that’s what he told Tennis Panorama News’ Dave Gertler at the Western & Southern Open in Greater Cincinnati today after being defeated by Tommy Robredo. For Djokovic, he’s the first #1 seed since 2008 not to reach the quarters. The dodgy Cincinnati ‘Capodimonte Cup’ continues to elude him. Australian Open Champion Stan Wawrinka made quarterfinals at the Cincinnati Masters today with a 3 set win over Marin Cilic 3-6, 6-0, 6-1. His first serve has been off as of late and Stan only hit 27% of his first serves today. I asked him about that and he acknowledged the issue. Wawrinka will meet Julien Benneteau in the quarters tomorrow. The head to head between the pair favors the Frenchman 2-1. Julien Benneateau had never beaten Jerzy Janowicz in ATP play until today, where he posted a 7-5, 6-1 win over the big Pole. Benneteau’s serve was on and he was patient with every point. He’ll need that serve when he faces Wawrinka for a chance to make the semis in Cincinnati, a feat he’s never reached before. “I am not the favorite, but I’ll have my chances and just be ready to take it”, he told me, referring to tomorrow’s match with Wawrinka. Fabio Fognini is the first Italian quarterfinalist at the Western & Southern Open since 1995. He doesn’t care who he plays in the quarterfinals tomorrow. He’s just thrilled to be here so deep in the tournament and peaking around the US Open. Simona Halep is getting used to the attention of being a world #2 and she dosen’t care if she plays on Center Court or not. This is her 2nd post-match press conference after acceding to her new post. She also answered an interesting question about being #1 whether or not you win a slam. Finally, Evina Svitolina beat Carla Suarez Navarro to advance to her first Premier-level quarterfinals today, getting revenge for Suarez Navarro’s win over her earlier this year in Linz. Svitolina’s next opponent is Ana Ivanovic. She spoke me with me after the match and discussed the improvements in her mental game. 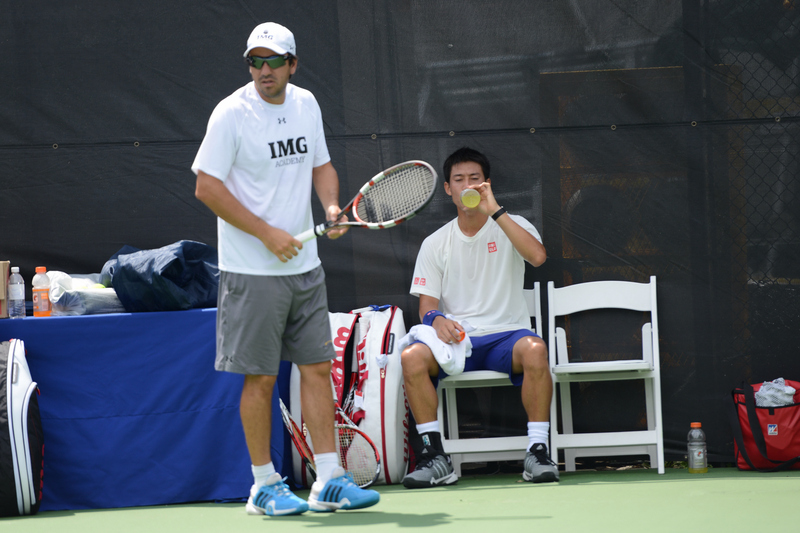 The 19-year-old is the first teen quarterfinalist here since Pavs did it in 2010. 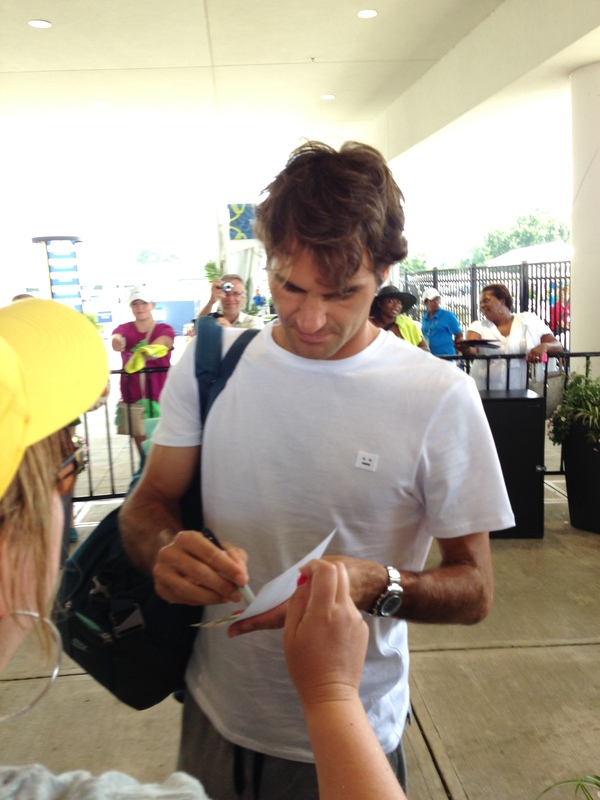 Posted in: ATP, Citi Open, Washington. Tagged: 2014, atp, Citi Open, dc, dudi sela, Interview, Israel, mens, tennis, video, washington. Dudi Sela gets his share of questions about Israel, but reporters are usually reticent to ask him to talk about the ongoing conflicts in the Middle East. Tonight, after his first round victory at the Citi Open in Washington, DC, Sela reflected on tennis in his home country and bemoaned the fact that there is not a crop of rising players waiting in the wings to take his place despite the sport’s popularity there. Then, he stunned many of us by mentioning that these days, his wife and child awake each morning at 7:00 a.m. and head to a nearby shelter for safety. His admission puts things in perspective. It also reminds us all that global athletic competitions like the ATP World Tour do their (small) part to try to bring nations and cultures together. Sela faces Richard Gasquet in Round 2 tomorrow on Grandstand 1 around 8:00 p.m.
Posted in: Citi Open, Washington, WTA. Tagged: 2014, christina mchale, Citi Open, dc, Ekaterina Makarova, Interview, LUCIE SAFAROVA, Magdalena Rybarikova, Russia, sloane stephens, stanford, video, washington, wta. At 1:45 p.m., top seed Lucie Safarova kicked off Tuesday play on Stadium Court. Magdalena Rybarikova was a two-time defending champion warming up on Grandstand court, about to begin her title defense. So much can happen in two hours. Quoteth the Morrissey, “The Queen is Dead, Boys’. The Queen of the Citi, Magdalena Rybarikova, went down in ignominious fashion today, 6-1, 6-1 to Ekaterina Makarova, a 53-minute drubbing not befitting the most dominant player in this WTA event’s short history. Top seed Lucie Safarova was also sent packing at the hands of KiKi Mladenovic 2-6, 6-3, 6-3. That leaves Ekaterina Makarova as new the King of the Court, er, Queen of the Citi. She took down the defending champ, she’s the top seed standing and she is now the favorite to take the title. Makarova made the quarterfinals at Wimbledon last month, and guess who beat her there? Safarova. She won’t have Lucie to worry about in Washington. BONUS: Ekaterina told me she chose Washington over Stanford because she likes Washington so much. Even though she’s never been to Stanford. Smart woman. The whole pecking order has reshuffled and this could really benefit Sloane Stephens, who is the second highest seed remaining in the Women’s draw. Um, except that Stephens lost tonight in her match against Christina McHale, 4-6, 6-4, 0-6(!!). The 1, 3, 4 and 7 seeds are gone (and the twice defending champ) and it’s only Tuesday. Stay tuned. Even by WTA standards, this is whack. Oh yeah. The winner of this event is clear…as mud. Posted in: ATP, Citi Open, Washington. 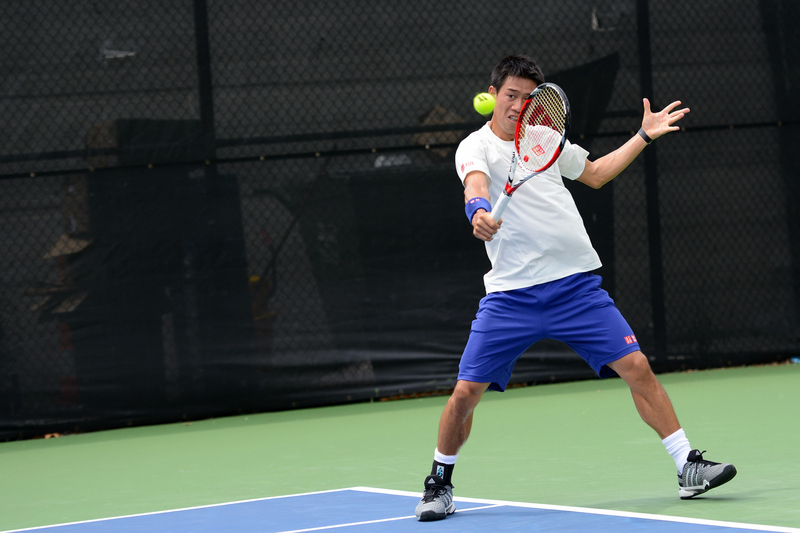 Tagged: 2014, atp, Citi Open, dc, Kei Nishikori, Kevin Anderson, lleyton hewitt, mens, milos raonic, Practice, Praction, tennis, tomas berdych, us open, video, washington. As a fan, sometimes you need a break from the matches during qualies. After all the newish names you hear on the courts on a qualifying weekend, you need a break from the new. You want to put on your comfy slippers. The ones you know so well. You know, the Top 25 or even, say, Players Who Have Won a Major. But you also want to see some tennis action right then and there. That’s when you need–Praction. The action of tennis, with all the big names, at a fraction of the price of being on Center Court because–it’s Practice Action. 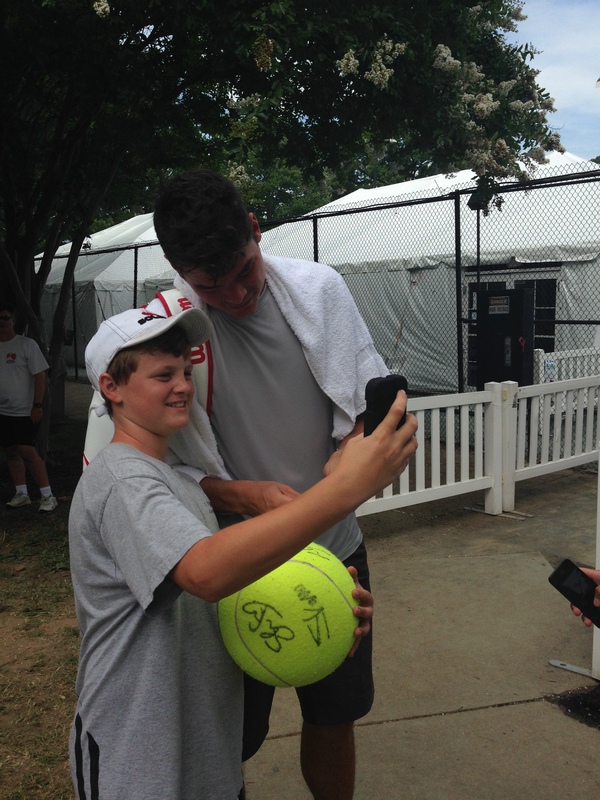 So here’s a Praction Round-Up from Sunday at the Citi Open in Washington. Let’s examine how much Praction you can get into in just one Sunday afternoon. Hewitt was in Cruz control again. This is the third time in a row I’ve seen son Cruz take the court before Codger Dad. I’m thinking Cruz is like a professional food-tester for Lleyton. Or just looking for ‘Bubbles!’ on the court. To Lleyton’s defense, there is absolutely nothing for a child to see in the way of sights in Washington, so this is an even better idea than it is in Adelaide. With John Isner stuck in Atlanta waiting to play his ATP 250 Final, the other skyscrapers, Raonic and Anderson, teamed up for a hit on Sunday. The security staff, not regular tennis fans, were naturally shocked by the duo’s distance from the court to their heads. The non-regulars ogled at them, more so for their size than their ability to smoke a serve so hard the fences shook. 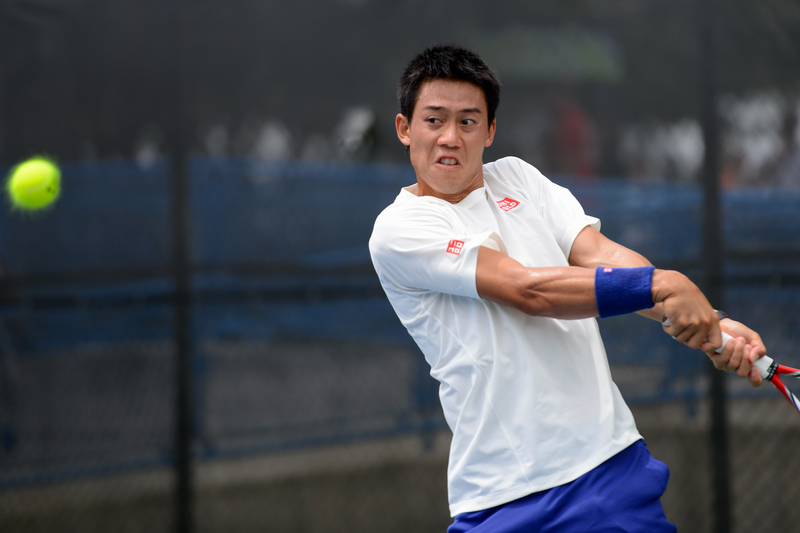 And finally, Kei Nishikori‘s Praction was featured in our last post. 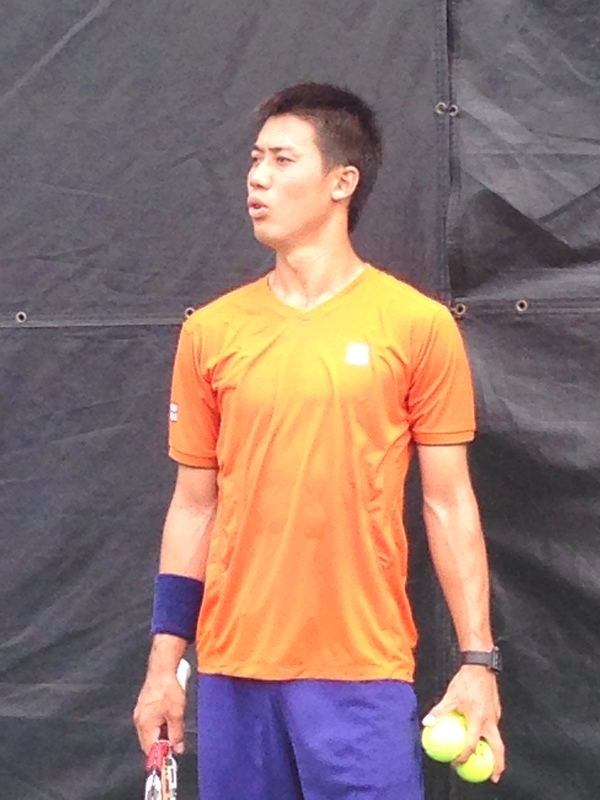 The best part of his praction was Kei himself checking out the vocal 2nd set tiebreak going on at the match court next door featuring Gabriela Dabrowski and Olga Rogowska (Rogowska won that tiebreak and the match in 3). The next time you don’t feel like going to qualies with your tennis-crazed significant other, just remember: there’s Praction out there. You know these guys! Posted in: ATP, Citi Open, Washington. 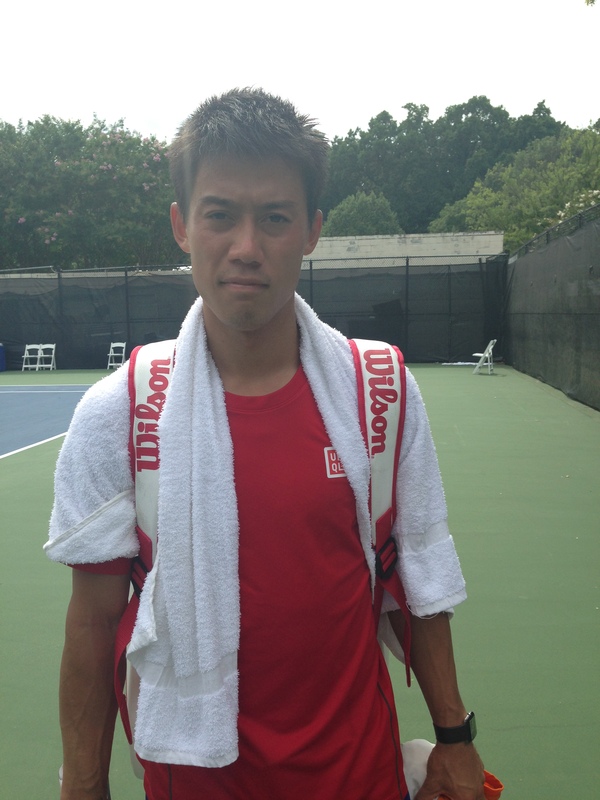 Tagged: 2014, atp, Citi Open, fans, japan, Kei Nishikori, mens, Photos, Pics, Practice, tennis, us open, video, washington. 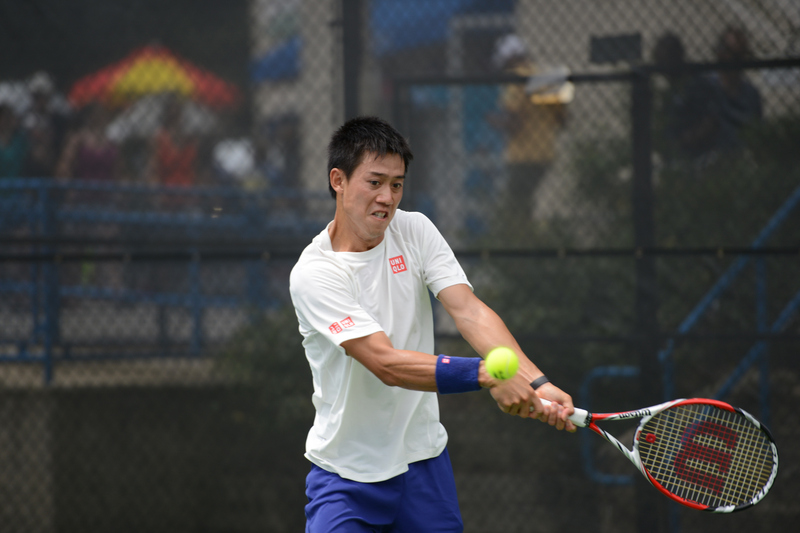 Kei Nishikori was the biggest fan draw this weekend at the Citi Open in Washington. Saturday and Sunday saw throngs of fans from the extended DC area longing for a peek at their All-Time Fave. On each occasion, Kei obliged, signing autographs and submitting to selfies for nearly ten minutes in the scorching heat after a hit. 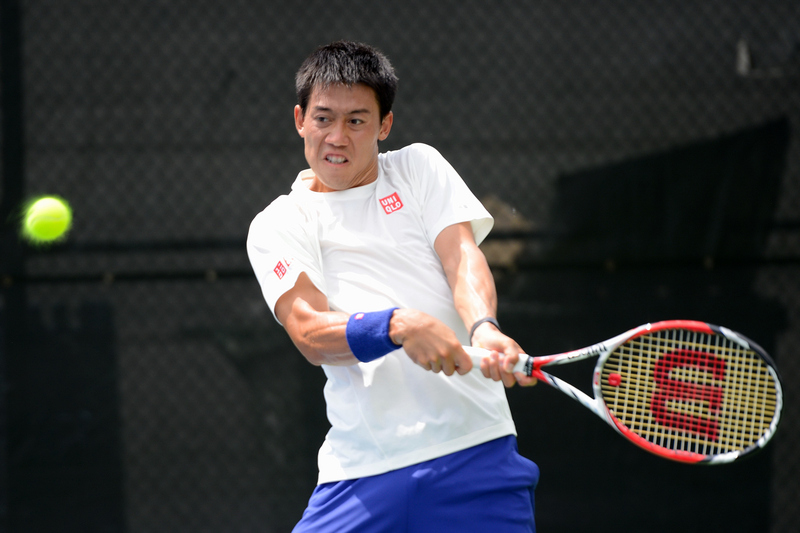 Nishikori is the 4 seed at the ATP World Tour 500 event and has a first round bye. He’ll open in Round 2 against the winner of Americans Sam Querrey and Michael Russell. Posted in: ATP, Newport. Tagged: 2014, atp, championships, Clay Thompson, Hall of Fame, Interview, Newport, tennis, UCLA, video. UCLA’s Clay Thompson was in great spirits and thrilled to play his ATP Main Draw Debut on the grass courts of the Hall of Fame Tennis Championships yesterday. There was just one nagging question. Why, oh, why did I have to draw Stevie Johnson? It was as if the PAC-12 moved to Rhode Island for a day and I almost expected the Rose Bowl Parade to march down Bellevue Avenue in Newport. 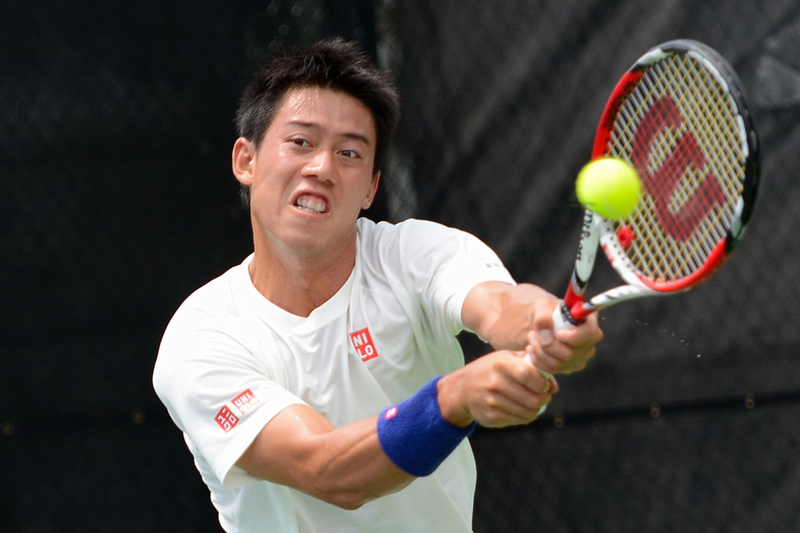 In the end, former USC phenom Johnson and his trove of pro tour experience was too much for Thompson in a 6-1, 6-2 loss. That said, we expect to see Clay winning plenty of matches on the tour in the near future. Caroline Wozniacki likes to remind everyone that she is only 23 years old. With so many accomplishments, it’s hard to remember that she still has a lot of championship-caliber matches remaining in her career. A four-time New Haven Open champion, Wozniacki discussed how evenly-matched the top 10 can be in a press conference at New Haven Open on Monday. When I mentioned that Angelique Kerber was sold on coming to 2013 New Haven based on Caroline’s own glowing reviews, she wasn’t worried that bringing would-be challengers to her favorite tournament would be a problem. She won’t have to play Kerber after all, as the German was upset yesterday. Wozniacki faces Karin Knapp and will likely reach another New Haven Quarterfinal today. Note in the video that Wozniacki’s Irish accent is pretty heavy now. The Brogue is apparently contagious and transmitted through continued close contact with Irish Legends.